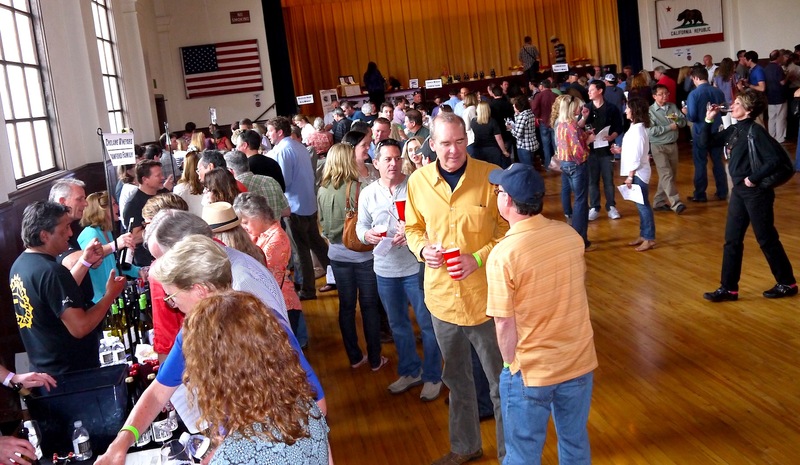 At Southern Exposure: Garagiste Festival, I tasted wines poured on Saturday, March 29. For the most part, I focused on the producers whose wines I had never tried. Cholame Vineyard features longtime local winemaker/vineyard manager Andy Ibarra at the helm. I met Ibarra during harvest 2006, back when he was making wine for Rideau. Ibarra has managed La Presa Vineyard in the Santa Ynez Valley for years, supervising the care and feeding of grapes sourced by many other producers. Now, with this label, he’s using fruit from both La Presa and other sites. The Cholame Vineyard Grenache blanc is crisp and complex. Andrew Graef, who founded his label in 2011, poured from a corner table, and to any tasters who accidentally passed him by, well, you missed out. Using Google, I discovered that Graef Wines is a client of Hollywood & Wine, which on its website notes: “Andrew Graef has lived many lives …. but has dedicated the past decade to studying enology, making wine for others and finally, launching his own label, Graef Wines.” No website. Graef’s viognier is very pretty, with only a hint of pear and lots of sweet apple. I often mutter that chardonnays just aren’t my thing, and then I taste one that perfectly suits me. Karen Steinwach’s Seagrape Chardonnay, from Zotovich Vineyards in the Sta. Rita Hills, was aged in stainless steel and just packs that Meyer lemon punch I so adore. I sampled three of Mark Wasserman’s wines Friday evening at the Cecco Ristorante pizza and wine pairing party that launched Garagiste. And I found him again Saturday to try two of them once again. Good pinot noir and the hot east side of Paso Robles are an oxymoron, but Wasserman has pulled off a delicate pinot noir that might as well come from grapes grown in the Santa Maria Valley, or Sta. Rita Hills. He does make a Reserve Pinot Noir with fruit from Santa Lucia Highlands, but I honed in on the Paso Robles’ version because I couldn’t believe how tasty it was. Wasserman told me during Friday’s event that he’s bottled wines in his garage, literally, for about 10 years, but has of late stepped up his game with Vinemark Cellars, which he founded in 2012. His Primitivo was a classic one, full of spice and dark fruit, especially pomegranate. Right before I left the tasting, a friend pointed me toward two more tiny producers, Sillix (winemaker Blake Sillix) and Carucci Wines (winemaker Eric Carucci). My favorites, from each, were the 2011 Sillix Grenache, Camp 4 Vineyard, which was chock full of dusty chocolate, and the 2010 Carucci Syrah, Thompson Vineyard (one of my favorite vineyard sites). The young Blake Sillix, who works for Justin Willet at Tyler, doesn’t yet have a website, but if you Google Sillix, you’ll see just what he’s been up to, and why you might want to track down this fellow to try his wines.